← Finally warm enough to plant! 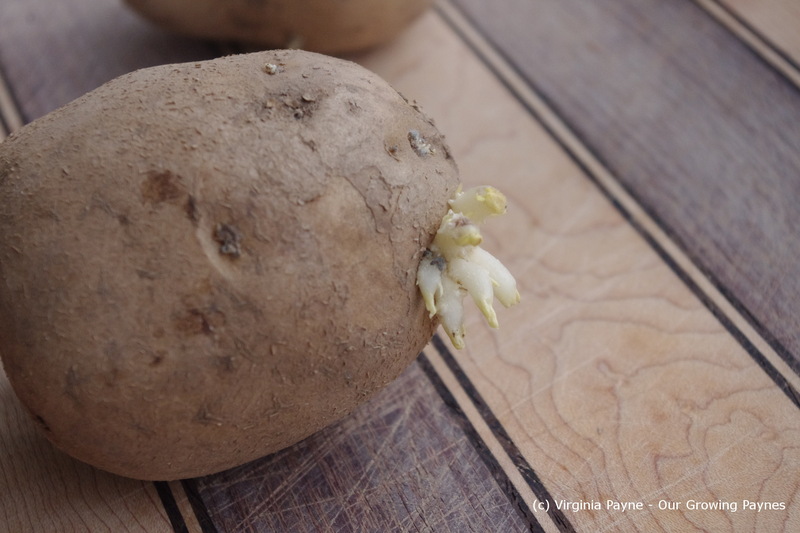 But the wind…..
We had heard over the years how wonderful fresh harvested potatoes were so last year we decided to give it a try. We did pretty well up to the point tiny little bugs stripped the leaves. Those little buggers eat really fast. We did get a small harvest and they were delicious. So this year we’ll be ready for the little twerps. The potatoes being planted are Red Norland and German Butterball. Because our plot isn’t big we needed a way to grow them without taking up a lot of space. I found last year on Pinterest loads of information about potato towers and that seemed perfect for us. And it worked very well. They aren’t hard to grow but there is a bit of prep to do before planting them. The seed potatoes get shipped mid April to our area. We get our stuff from High Mowing in Vermont. They are great but I do recommend buying your seed from an organic source near your zone. That way you know it is adapted for your growing conditions. The potatoes need to be sliced so each chunk you have has some “eyes” on it. This is where the potato plants grow from. The cut sides need to be treated with sulfur to prevent rot. Now last year we were very careful to follow directions. They had to dry completely before planting. But then the next direction was to put them in the soil and water well. What’s the point? So this year I cut them all up and treated them. I let them be in the sun while I put the towers together. As the potatoes grow more soil is added so you need enough height to accommodate the growth. It is also good to have composted soil for this as the potatoes need lots of nutrients. We had some old wire fencing so we use these for the forms of the towers. 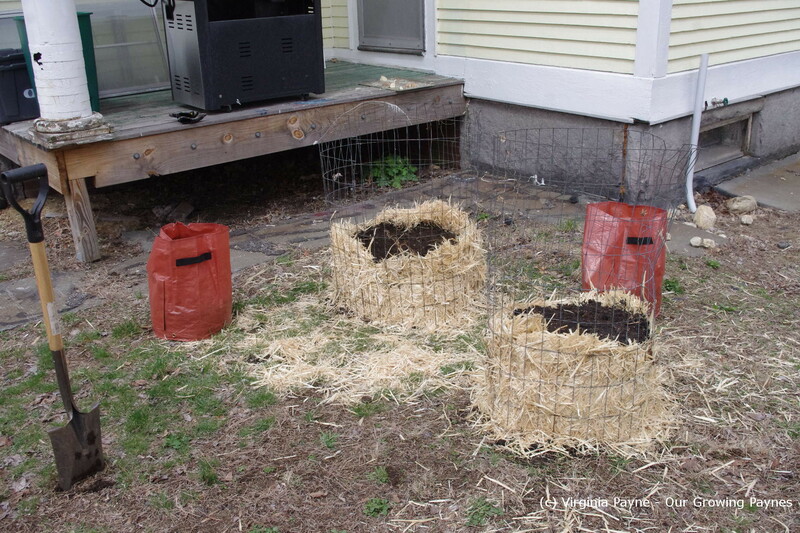 Line the bottom with the compost and line the sides with straw. 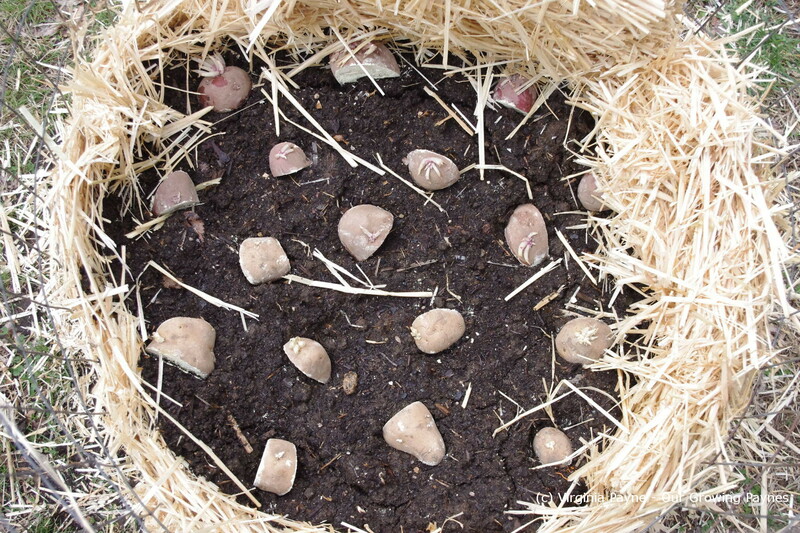 Fill the tower with about 6 inches of soil, water well then place the potatoes in with the eyes pointing upwards. 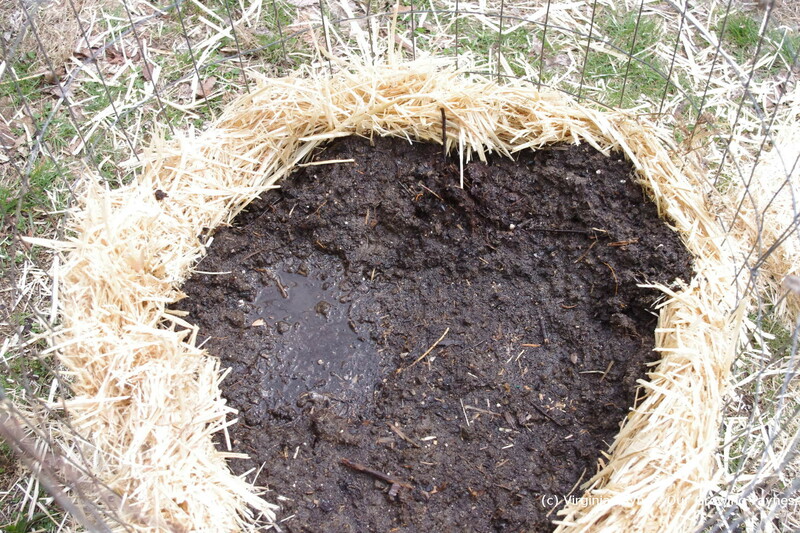 Cover with a couple inches of soil and water well. 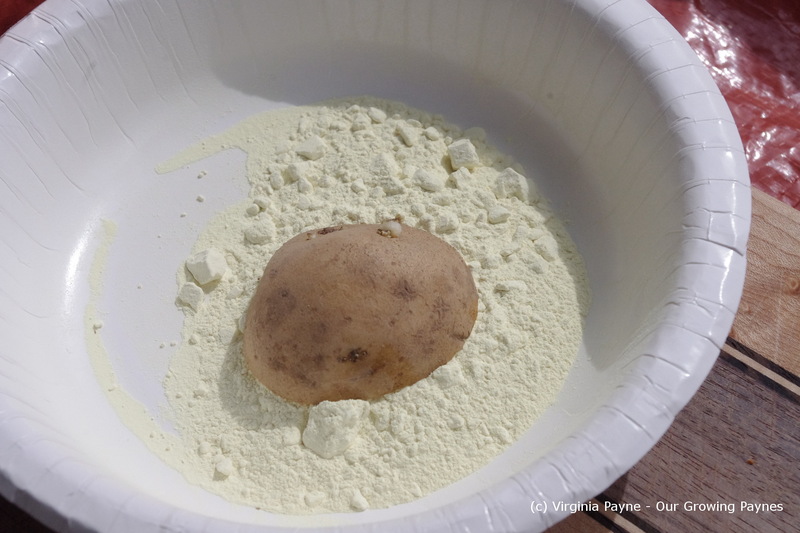 This entry was posted in Gardening and tagged food, garden, gardening, kitchen gardens, nature, planting potatoes, plants, potatoes, seed potatoes. Bookmark the permalink. I remember fondly the home-grown potatoes at my parents’; they were well worth the effort! We now grow our potatoes in woven shopping bags, much easier and can be transported around the garden! Doesn’t that get heavy? How big are the bags? 30cms x 50cm – they were only good for one season as they rotted. We planted 3-4 potatoes in each. They weren’t too heavy as they started off with a shallow level on earth and then as they grew with filled them up in stages. So they were moved around to fill in gaps. A friend grows his in plastic carrier bags – using the same method but I can’t see those lasting the season. We also bought these to begin with http://www.marshalls-seeds.co.uk/growing-potatoes-in-bags-or-potato-sacks-ggid31.html but they were quite costly for the amount of potatoes you can harvest. Thanks for the info. 🙂 I’ll be curious to see how the small bags we got last. It certainly makes it easier to harvest! Interesting she was doing it in a jar! I hadn’t read any further down (as I just wanted a picture of the bag to show you) until you mentioned jar! Now having gone back and reading further, it all sounds very interesting I think I might have a new blog to follow!! They can be kept outside for a while after harvesting, as long as you keep them in mounds and cover with lots of earth to prevent any sunlight from getting to them. I don’t remember how long huge mounds in the fields were left like that before being sold off. Certainly not months, if I remember correctly. I’ve seen that done in magazines. That might work until it gets too cold here. We don’t treat our potatoes after we cut them. Maybe it’s because we have such dry weather? No issues with rot before they begin to grow. Fascinating! We can have dry spells here but we also get a ton of rain so that may be why we have to treat them. I think this is so the water doesn’t wash the sulphur off straight away? It must “set” or harden enough before you plan.. but I wouldn’t know, lol, just guessing:D These are cute little towers.. 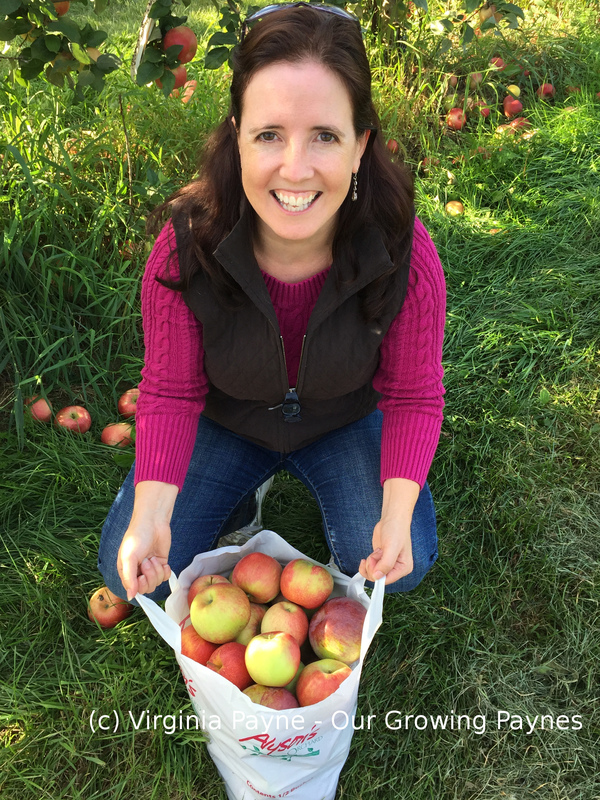 I can’t wait to see your harvest! I’ve never seen a tower for growing potatoes. That’s such a great idea! Can’t wait to see the yield later in the year. When I found several references online about the towers I was immediately on board with the idea. Such a space saver. It’s a great thing to try. So yummy. What a brilliant idea – love it. Not even sure what kind of bugs they are but they are very tiny and red. So this year I’ll be ready for them. Didn’t know that about sweet potatoes. Good to know. Didn’t think of planting them whole. But yes, as long as there is an eye on the part of the potato you are planting then you get a plant. Definitely makes it economical as these were $11.50 for 2.5 lbs for each type. this is so interesting…i may never get to do this at all…. This is really helpful. I loved all the great potatoes grown in England and struggle to find good varieties of potatoes here. So 2 years ago I tried to grow some with very limited success. Next time I will follow your steps. Do keep us posted on these! that’s awesome. 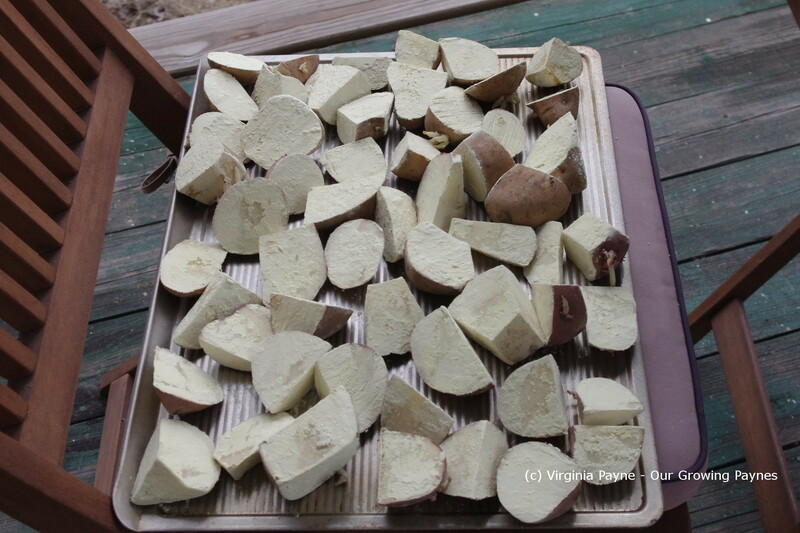 I grew a small crop of sweet potatoes last year and they are delicious! Can’t wait to see the potatoes grow! I should try sweet potatoes some time as my family loves them. Me not so much. 🙂 They are not sweet to me!